Clearly, if you read yesterday's post you'll know I've gone from a new product drought to virtually drowning in new stuff. I did also go to the Trafford Centre yesterday and decided to treat myself to some more bits. 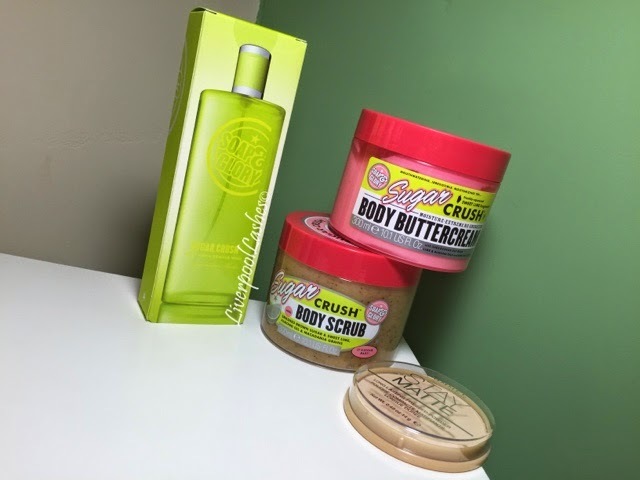 I'm obsessed with the scent of Soap & Glory Sugar Crush, it's really sweet and zesty so I decided to get the three for two offer in Boots and get all three in this scent! I chose the scrub which I've had before and absolutely adore, it's probably the best scrub I've ever used. I then bought the matching body cream which I haven't tried in that particular scent before. Finally I bought their fragrance mist which I haven't tried before either. Two products I've bought time and time again are the Rimmel Pressed Powder which is just so cheap but works so well that I always find myself returning to it. The other were the double oval cotton pads, they're just the best - super soft and huge. I then went over to Selfridges and treated myself to the Nars Creamy Concealer which I have heard so much about so I shall see how it goes!